Here we have paired cuff pants made of the Madras fabric with a coordinating navy shirt. 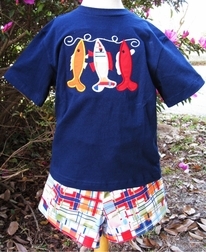 On the front of the shirt we have appliqued a string of 3 fish-it was a very successful fishing trip! 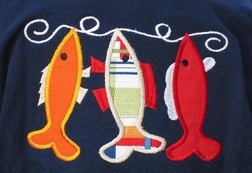 The first fish is made from orange fabric, the middle fish is made from the Madras fabric, and the third fish is made with red fabric. Add a name monogram of your color choice to personalize the outfit.